(UM Legislative News Service) Gov. Steve Bullock says he wants to shift the conversation on Medicaid expansion this legislative session. At a press conference Tuesday, Bullock presented a study from the Montana Department of Revenue and the Department of Labor and Industry. Bullock used the study to outline how Medicaid expansion has benefited businesses and the economy since it passed in 2015. 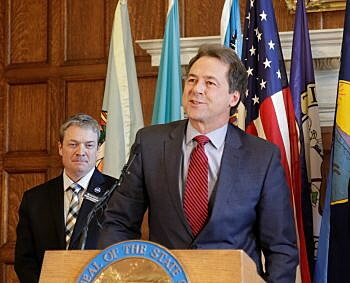 “In almost three out of five businesses in our state, those businesses rely on Medicaid expansion to provide health care for some portion of their employees,” Bullock said. In 2015, a group of moderate Republicans broke away from conservatives to expand Medicaid. Nearly 100,000 Montanans are now enrolled, which is more than predicted. Republicans say they are still hesitant about the size of the program and Speaker of the House Greg Hertz, R-Polson, says making Medicaid expansion sustainable and affordable will be a main concern. “I think the goal of a lot of legislators is to try to continue the Medicaid expansion program but to put some sideboards on it,” Hertz said. Hertz says adding work requirements, asset and drug testing are ideas floating around that could contain enrollment in the program.